Tourism largely occupies the region with attractions such as Arches and Canyonlands National Parks, the Colorado River, Dead Horse Point State Park, two riverside resorts, a dinosaur museum, Moab Giants and a great array of tours. The Moab Library earned the Best Small Library in 2007 when it was new. The Moab Regional Hospital replaced the 1950s Allen Memorial Hospital installment. The Utah State University has a satellite campus in Moab with designs on an improved larger one in the near future. UMTRA is removing the uranium tailing pond. As of fall 2015, 50% of it has been removed and transported to a less populated location north of Utah. Synergy Company, and Intrepid Potash, plu governmental office for the city, county, school district and National Park Service are the larger non-tourism employers based in the city/county. 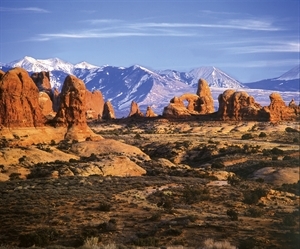 Great outdoors with stunning red rock landscapes. All outdoor activities such as hiking, biking, rafting, paddleboarding, running, canyoneering, climbing, Jeeping, dirtbikes, ATV, UTV, Aquatic Center, Rec Center, horseback riding, golfing, Aerial Adventures, and more. We have an amazing Senior Center that has many activities weekly indoors and outings for seniors. Moab has Museums, local wineries, Music Festival, Folk Festival, Celtic Festival, Art Walk, Artists in the Park, Art Galeries, and shops. Lectures at the Library, and the Moab Information Center. Multi-Cultural Center to learn languages, satellite university for classes. Canyonlands Regional Airport has daily direct flights to Denver, Colorado. Jan 19.6 F° 31.6 F° 43.5 F° 0.7 "
Feb 25.9 F° 39.2 F° 52.5 F° 0.5 "
Mar 35.0 F° 49.5 F° 64.1 F° 0.9 "
Apr 42.0 F° 57.6 F° 73.2 F° 1.0 "
May 49.9 F° 66.8 F° 83.6 F° 0.8 "
Jun 57.6 F° 76.3 F° 95.0 F° 0.4 "
Jul 64.1 F° 82.3 F° 100.5 F° 0.9 "
Aug 63.4 F° 80.8 F° 98.1 F° 0.8 "
Sep 53.4 F° 71.1 F° 88.8 F° 0.8 "
Oct 40.6 F° 57.8 F° 75.0 F° 1.3 "
Nov 29.5 F° 43.4 F° 57.2 F° 0.8 "
Dec 21.4 F° 33.5 F° 45.7 F° 0.6 "
Spring temperatures are cool with averages in the upper 50's and highs in the low 70's. Nights are cold with lows in the low 40's. Summer temperatures are warm with averages in the upper 70's and highs in the upper 90's. Nights are cool with lows in the low 60's. Fall temperatures are cool with averages in the upper 50's and highs in the low 70's. Nights are cold with lows in the low 40's. Winter temperatures are cold with averages in the mid 30's and highs in the upper 40's. Nights are cold with lows in the low 20's. Condos Over 50 Communities No affordable housing options at this time, however, local leaders working on the plans. We do not have a City property tax, and the certified Grand County property taxes have not been raised in 10 years. Home care Senior center Visiting nurses We have a new hospital, the Canyonlands Care Center for the elderly. The Grand Center is for seniors and has daily lunch for a minimal donation every day except Thursdays. Volunteer opportunities at the Library, Hospital. Workforce Services in the area can help to facilitate openings or requests for volunteers or jobs.